“We anticipate being provided with constructive feedback’’, he said. 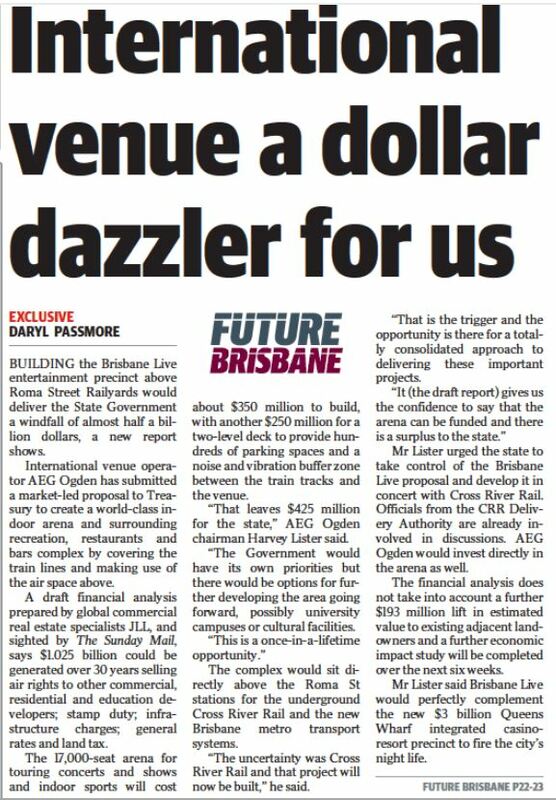 The Brisbane Live concept — modelled on the hugely successful LA Live complex in the United States — has been under assessment for the past 12 months through the Palaszczuk Government’s market-led proposals scheme to encourage private initiatives to boost the economy and create jobs. Tourism leaders say the development would help lift the Queensland capital to a new level, competing with cities such as Melbourne as a major events destination. There is strong support within government for the plan and The Sunday Mail understands this week’s meeting is likely to see it move to stage two, finetuning the project details including due diligence. “We are quite optimistic Brisbane Live is now receiving the focus it need within the State Government to enable it to happen,’’ Mr Lister said. The chairman of Brisbane-based international venue management group AEG Ogden, has already prepared a 150-page detailed financial brief and engaged JLL — one of the country’s leading commercial property agencies — to explore the opportunities to attract private investment in hotels, apartments, restaurants, shops, offices and possibly even education or research facilities around the 17,000-seat main arena. “The redevelopment concept for the whole of the Roma Street site is a truly unique one-in-a-lifetime opportunity and we believe its time has come,’’ he said. “Very few cities globally have the opportunity to create a commercial, educational, leisure and entertainment precinct in a wold-class garden setting on a 20-plus hectare site right in the middle of the city,’’ Mr Lister said. He is hopeful the proposal could get final approval within a year and wants to see it built by 2021-22 to coincide with the opening of Brisbane’s new $3 billion riverside casino-resort complex just a 10-minute walk away. The arena could host performances by music superstars, big-ticket stage shows such as Aladdin and The Wizard of OZ, and indoor sports spectaculars like touring American NBA basketball and NHL ice-hockey as well as international tennis tournaments. Queensland Tourism Industry Council chief executive Daniel Gschwind said: “The need for a bigger events arena has clearly been identified especially as we attract more and more events. Existing facilities are at capacity. The Brisbane Live precinct would be built on a ‘’lid’’ above the rail corridor between the Normanby Fiveways and Roma St Forum. JLL Australia chief executive Stephen Conry said the proposal was “a terrific vision to unlock an enormous and under-utilised part of the CBD” which was currently an eyesore into an unparalleled investment opportunity. It was the final piece in ‘’an emerging jigsaw’’ that would open an entertainment corridor all the way from Suncorp Stadium to Queens Wharf and across the river to South Bank. State Opposition leader Tim Nicholls said the LNP was right behind the ‘’game-changer’’ Brisbane Live project and, if elected, would overhaul the market-led proposals process to speed up approvals. Brisbane Lord Mayor Graham Quirk said he wanted to see Brisbane Live progress and boost tourism, along with Queens Wharf, the new Brisbane Airport runway, new cruise ship terminal and the Metro public transport system. EVERY now and again the State Government is presented with a gift – a visionary, transformational project that creates jobs, leads to long-term prosperity, and elevates Brisbane as a world-class destination. The most recent, of course, is the Queen’s Wharf project, a $3 billion masterpiece bankrolled by Star Entertainment that will rejuvenate the river precinct from Queen Street to Parliament House. It will link, via a bridge, to South Bank, creating fantastic synergies with the city’s arts and culture hub. With South Brisbane flourishing and the West Village project breathing new life into West End, the stars are aligning. With Brisbane set to get a second runway by 2022, the state capital is shaping up to be an exciting, world-class destination within five years. And now we have a new kid on the block, and it’s a gift for the Government as well. Brisbane Live is emerging as a wonderful complement to the buzz happening around Queen’s Wharf. The central plank of the $2 billion Brisbane Live precinct is a new 17,000-seat entertainment centre on the old Roma Street railway yards site. It would mean an end to the long trek to Boondall for world-class entertainment. Few cities globally have the opportunity to create a commercial, educational, leisure and entertainment precinct in a garden setting on a 20ha site right in the middle of the city. Tourism is booming in the Sunshine State. The upcoming world title boxing matchup between Jeff Horn and Manny Pacquiao is set to be a massive income-generator for the state. The positive flow-on effects from such an arena and the events it will host are undeniable. The redevelopment concept for the whole of the Roma Street site is a unique, once in a lifetime opportunity. There is bipartisan support for Brisbane Live and it’s clear that Treasury boffins see its value, and they should be commended for that. Brisbane is firing and this will only add to its lustre. With demolition work for the Queen's Wharf casino and entertainment precinct well under way, a $2 billion entertainment precinct on the other side of Brisbane's CBD moved a step closer late last week. Venue operator AEG Ogden has been pursuing its market-led proposal for the Brisbane Live entertainment precinct, which would include a $450 million, 17,000-seat arena built on top of the Roma Street railyards, for more than a year. AEG Ogden representatives met with Deputy Premier Jackie Trad and Treasurer Curtis Pitt last Friday and it was understood all parties were encouraged by the progress. "Brisbane Live is an exciting idea, and has moved on considerably since it was first proposed," Mr Pitt said. "The meeting on Friday was very constructive and we have agreed to continue exploring options for progressing the concept including financing options." AEG Ogden chairman Harvey Lister described Friday's meeting as "positive" and welcomed the opportunity to directly brief senior government ministers. "It was a chance to update the government on the significant progress we have made so far," he said. "We have engaged specialised property and investment firm JLL to undertake further work on funding options and economic impacts. "I look forward to meeting with the government again in a few months when that work is completed." AEG Ogden has insisted the Brisbane Live arena would be a complementary facility to the much maligned Brisbane Entertainment Centre at Boondall, which it also operated along with Suncorp Stadium and the Brisbane Convention and Exhibition Centre. But the reality was, barring scheduling conflicts, all big-ticket concerts would return to the inner-city in a way not seen since the long since demolished Festival Hall's heyday. Brisbane Live would link King George Square to the Barracks on Petrie Terrace and be built above planned Cross River Rail and Brisbane Metro stations. The existing Roma Street Transit Centre would make way for residential, hotel and commercial towers, the tallest of which would be a 90-storey residential tower. The project already has the support of Brisbane City Council, with Lord Mayor Graham Quirk this week citing Brisbane Live would add impetus for his $944 million Brisbane Metro mass transit system. The Palaszczuk government's market-led-proposal scheme allowed private companies to pitch ideas for state-owned land, rather than the government putting it out to tender. It was this scheme that saw plans for new mega-cruise ship terminal at Luggage Point progress to the in-principle agreement stage in April. Ms Trad said Brisbane Live was a good fit for the government's aim to ensure high-quality development in Brisbane. "I look forward to further discussions with AEG Ogden to look at what may be needed to bring the concept to reality," she said. The Liberal National opposition has been broadly supportive of the project, but shadow treasurer Scott Emerson has criticised the length of time the market-led proposal process had taken. What is wrong with the other venues that are around in the City and suburbs? I agree with Metro do we REALLY need another venue? Whether we need another venue is an interesting discussion, but you can't really compare the Brisbane Live proposal with the QE II Stadium - they are completely different venues. The one that Brisbane Live is more like a duplication/replacement for is Boondall. I'm personally a fan of Boondall, but it is in a difficult position and is not exactly state of the art. Brisbane Live would be in the best location in the whole city for public transport access. I think the real test of Brisbane Live will be how much public money they want put into it. If they will mostly fund it themselves I say good on them. If they get serious about the Olympics bid we would need all of these venues and more. BECAUSE they are in the wrong place. This isn't. Brisbane's inner city does have a shortage of live venues, and has for many years. This is private capital anyway, why is this an issue for you? I agree. The nearest comparable place is BEC and that's in the middle of woop woop land, and is an absolute pain in the neck if you need to get back to the city in time for the last trains and that event you are going to finishes late. It's also not near any dining facilities which is something many do like to go to before or after an event (eg: a concert). I'm all for this project and hopefully it goes ahead. Not sure what will happen to BEC, but personally I'd rather see it knocked down and burned to ashes, it's a horrible event place with the stench of Sir Joh. I realized you're not 100% serious, but maintaining an existing asset is much simpler and cheaper than building one. The BEC is a terrific place for things like the State Schools Spectacular and other large community events. I would advocate keeping it even if it was only used a couple of times a month. And, as I say, it would be extremely useful if we were ever to be serious about something like an Olympic bid. I believe Brisbane Live will be a game changer and the state government should make it as easy as they can to help the private sector make this a reality. While Brisbane Entertainment Centre is not a bad venue, it is in an awful location that is not central or easy to get too. Every major city should have a central entertainment hub close to transportation and other major infrastructure such as hotels, which the facility at Boondall does not offer. The major rejuvenation of this eye sore that is the transit centre should be very welcomed. It will also help to make Cross River Rail look more attractive while generating 1000's more construction jobs. Doesn't their development plan has apartment/office towers where the Transit Center is now? Could this end up getting tied into the redevelopment of the Roma Street precinct as part of CRR? If this is privately funded with Government's only involvement being to give/lease them the land, could they sweeten the deal by giving them the extra land from the Transit Center in ask for $$$ for CRR? ALMOST 8000 jobs would be created developing a new $2.5 billion entertainment and education precinct in the centre of Brisbane under a proposal to be unveiled by the LNP today. Opposition Leader Tim Nicholls says his party will fast-track the Brisbane Live arena project put forward by entrepreneur Harvey Lister for the Roma St railyards if it wins the next state election – and expand it. The new version – dubbed BEEP (Brisbane Entertainment and Education Precinct) – would add a university campus, a health and medical hub, a world-class film and TV production centre, and a Times Square-style public space. The development would add 12ha of extra public space to the existing 23ha Roma St Parkland. The existing transit centre would be demolished and replaced with a new one, with space for the Cross River Rail underground system. Up to 7750 jobs would be created during construction. “The greatest risk Queenslanders face today is job insecurity. In the last year alone, more than 30,000 Queenslanders lost their jobs – the worst year on record. That’s why it’s important we get behind projects like BEEP,’’ Mr Nicholls said. “Imagine a packed crowd pouring out from a Brisbane Live event into a Times Square-type area,’’ says Tim Nicholls. Detailed plans already submitted to the Palaszczuk Government by Mr Lister’s international venue management company, AEG Ogden, for its Brisbane Live concept – featuring a 17,000-seat indoor entertainment and sports arena, a 4000-capacity rock club, cinemas, restaurants, bars, shops, a public plaza, hotels and apartment buildings – would be fully incorporated. Mr Nicholls said the LNP would grant AEG Ogden a two-year exclusive mandate for a fully costed business case to develop the site over the top of the railyards, and he promised to assess it within four months under a “supercharged’’ Market-Led Proposals framework. A public square would be “an absolutely critical feature’’ of the expanded project. “Imagine a packed crowd pouring out from a Brisbane Live event into a Times Square-type area,’’ Mr Nicholls said. Tenders would be invited for a new university campus and he said the LNP had already received expressions of interest from Australian institutions. An international university seeking a local presence was also possible. Mr Lister was yesterday in Dubai and unavailable for comment. Hmm. I feel a bit sceptical - not least because it is coming from politicians just before an election. We have been down this road before. the Woolloongabba GoPrint site than Roma Street?? BEEP is up there with BaT and Cleveland Solution, bullet trains to Wide Bay not withstanding ..
At least they have announced something Bob, more than they have said about CRR. The story also eludes it will connect to CRR, so maybe they will support it, we can only hope!! A university? Is that really necessary? So not really public space at all then. King George Square is public space. But South Bank isn't. The litmus test is 'can you hand out flyers without anyone's permission'. I have to echo this sentiment. I don't think we need another university campus in the inner city. Something like Manchester Arena could work really well, built partially (or fully) over the top of the railway tracks, with some other 'places of interest' surrounding the area. A Federation Square-style development would also not go amiss. On the whole though, I'm really not too fussed with the area above Roma St station remaining undeveloped. Personally, I'm 75% OK with this...... I think all will likely agree, something has to be done to redo the very ordinary "Transit Centre" and the surrounding area is long overdue for improvement. 1) don't confuse Uni Campus with new university - we sure don't need a new uni in Oz, for 25 million or so people, we've got way too many as is. We'll have to wait and see further details......IF they could tie any educational offering into elements of the performing arts in some way ie, event and facilities management, it clearly MAY have real world training potential - I'd have preferred to see more a new business "TAFE" type college...but again, we need more hard facts. 2) I'm rather "suspect" [and then some] of TV/Film production facilities......these often spell fiscal nightmare over the long-term and again, we need more specifics on this aspect as well! Time and more details will tell......but "the 50Kft view" says a good general concept in my opinion. I strongly suspect that this "windfall" does not include costs the government and council would bear, such as roadworks and closures, public transport changes, planning and approvals, and probably myriad relaxations and fast-tracking that will need to occur, as well as subsidies for various secondary components of the complex, particularly things like a university campus. Still, if the whole thing ended up being close to cost-neutral to the public purse in the long run I think it would be a good outcome for the city. This thing will be so much better for the community than the casino, for example. A HUGE base for parking and servicing driverless cars and buses could be created as part of plans for the Brisbane Live entertainment arena in the heart of the city. The 17,000-seat indoor venue and surrounding precinct would be built by covering the Roma Street Railyards and constructing above it. And the group behind the proposal says extending another level below the arena all the way across the 12.5 hectare site could create what it has dubbed the “Brisbane Grand Central Transport Interchange’’. Underground stations are already planned for the new Cross River Rail and Brisbane Metro high-frequency public transport systems being built over the next seven years. But Harvey Lister, chairman of Brisbane-based international venue operators AEG Ogden, says the city has the chance to do something even bigger and become a world pioneer in the introduction of the vehicles of the future. “The big thing that has to be thought about, looking forward, about is mobility as a service and autonomous vehicles,’’ he said. With projections that far fewer people will own cars, instead hiring driverless cars for periods of time, those vehicles had to be stored somewhere, preferably centrally. “You need a place where they can be checked and cleaned and washed between clients, where they can be recharged with electricity, where they can be serviced. The same went for autonomous minibuses and coaches that would be required to transport the wave of tourists, particularly from China, predicted over coming years. Extending a five-metre deck between the rail lines and the arena across the proposed precinct — running from the Roma St Forum to Normanby Fiveways — would create space for thousands of vehicles. “Imagine a world-class arena with a transport interchange directly beneath with heavy rail, Metro, buses, taxis, ride-sharing, limousine concierge services and autonomous vehicles with multiple entry and exit points,” Mr Lister said. “This is city-defining urban renewal. We’re just trying to present a vision of what could be done. Lord Mayor Graham Quirk, who was briefed on the idea by the AEG Ogden team on the idea last week, said: “The Brisbane Live proposal would be a great addition to our New World City. “The proposals put forward would complement the Brisbane Metro and Cross River Rail that will interconnect at the Roma Street station precinct,” he said. An analysis of the commercial development potential and an economic impact study for Brisbane Live will be presented to Treasury officials within weeks. A NEW $2 billion entertainment precinct over the Roma Street railyards will be built as part of the Cross River Rail initiative, The Sunday Mail can reveal. The Brisbane Live proposal – including a world-class 17,000-seat indoor arena, restaurants, bars and cinemas – will be planned by the Cross River Rail Delivery Authority set up to develop the $5.4 billion train tunnel and underground stations network. The move, to be announced by Labor on Sunday, virtually guarantees the city-changing entertainment precinct will go ahead because an expanded version – dubbed Brisbane Entertainment and Education Precinct – has already been promised by the LNP, even if it scraps Cross River Rail. Harvey Lister, chairman of Brisbane-based international venues operator AEG Ogden, which is proposing Brisbane Live, says the bipartisan support is great news. The CRR Delivery Authority will partner with Mr Lister to ensure the project goes ahead, and Infrastructure and Planning Minister Jackie Trad said a new masterplan would be drawn up to revitalise the whole area. It is seen as the final piece in an entertainment triangle, with the new $3 billion Queen’s Wharf casino-resort precinct and the South Bank cultural area, in creating an international-standard nightlife in Brisbane. Labor has not detailed funding but financial analysis, commissioned by AEG Ogden and prepared by global commercial real estate specialist JLL, found the project could be built with a profit by generating “value-capture’’ income from selling air rights to other commercial, residential and education developers, stamp duty, infrastructure charges, general rates and land tax. Cross River Rail and Brisbane Live will progress as a joint project at Roma Street, with Labor announcing on Sunday the entertainment project would be planned and delivered under the Cross River Rail Delivery Authority in partnership with AEG Ogden’s Harvey Lister. The proposed Brisbane Live includes a 17,000-seat arena, cinemas, restaurants and bars. Deputy Premier and Transport and Infrastructure Minister Jackie Trad said Labor was committed to creating a world class city through visionary development and an integrated and modern public transport system. “Brisbane Live is proposed for a location that is right in the heart of the current Roma Street precinct, which is an underutilised area in proximity to key destinations like Caxton Street, the Paddington Barracks and Suncorp Stadium,” she said. “The Palaszczuk Labor Government’s decision to fully fund the $5.4 billion Cross River Rail project creates further momentum for Brisbane Live because the new underground Roma Street station will enable a whole precinct of redevelopment and revitalisation. THE fate of a new $2 billion entertainment precinct in Brisbane’s CBD will be tied to the success of the Cross River Rail program under a Labor state government. Infrastructure and Planning Minister Jackie Trad said today the delivery of Brisbane Live in the Roma Street Parkland was “absolutely integral” to the delivery of the $5.4 billion underground rail project. It is proposed Brisbane Live, an open air precinct similar to Melbourne’s Federation Square, would be built above the existing Roma St rail lines under the Cross River Rail Delivery Authority in partnership with AEG Ogden’s Harvey Lister. “The Roma Street area has long suffered from tired old infrastructure as well as being in a location in the city that is more functional and operative than beautiful,” Ms Trad said. The Liberal National Party supports the construction of Brisbane Live but has not committed funds to the Cross River Rail. Ms Trad said opposition leader Tim Nicholls needed to come clean with the people of Queensland as to whether he could cut the major rail project. Pauline Hanson’s One Nation has promised to scrap the Cross River Rail and use the money set aside for it to fund regional projects if it wins the balance of power on November 25. A Galaxy poll of 900 Queenslanders last week showed support for the LNP had dropped to a five-year low of 32 per cent ahead of the state election while the Labor vote was unmoved at 35 per cent. Excellent news. Does this mean that if the LNP cancels CRR, it will effectively be cancelling Brisbane Live too? Or do they plan to build Brisbane Live next to the shabby existing Roma Street? Really I would've thought today would've been a really beneficial time for Tim to come out in favour of CRR to effectively nullify Labor's advantage here, but instead we have Tim putting a figurative gun to his political aspirations by refusing to comment on if the LNP is willing to do a deal with Pauline Hanson for a coalition. Labor are running right over Tim. Ultimately if CRR becomes a reality and the entertainment precinct is built it will be a real drawcard. Roma Street is beautiful but there's not much else to draw people in. Comparing "Live" to other stadiums....come on! 1) there's a generation difference...most of the other venues are in serious need of a major tart-up in any case! 2) the primary reason WHY many of these other venues struggle, is they were built in areas that didn't really fit well, with transport and supporting infrustructure and amenities - some do, most don't. "Live" will sit at the heart of both the heavy rail and, in time, light-rail metro networks.....once we get through a decade or so of the "banana bus" madness of course! also.....the real "game" here, is the inevitable rationalisation of venues when "Live" becomes a reality! 1) Fill it in with concrete. 2) Keep it unused for their ludicrous Hyperloop fantasy, making sure it is built too small for conventional trains to use. PLANS for a new $2 billion entertainment precinct in the heart of Brisbane have taken a major leap forward. The State Government is directing $5 million to a formal business case to support the Brisbane Live! proposal in a sign of commitment to the development above the Roma Street Railyards. “Brisbane Live! is a very exciting proposal that will deliver decades of economic and employment opportunities in what is an underused part of the city,” Deputy Premier Jackie Trad said. The project — modelled on the LA Live! concept in Los Angeles — will feature a 17,000-seat arena for entertainment and sports events as well as restaurants, bars, cinemas and other venues and scope for hotel, apartment, commercial and education developments. The vision is being developed alongside the Cross River Rail network and would be above the new Roma St underground station. It is the final piece in a once-in-a-lifetime infrastructure boom over the next 5-10 years that will position Brisbane as a world-class city and tourist destination. Brisbane Live! will complement the $5.4 billion CRR, the $1 billion Brisbane Metro public transport system, the $3 billion Queen’s Wharf casino, entertainment and hotel precinct, the $1.3 billion second runway to double flight capacity at Brisbane Airport, the $160 million new cruise ship terminal to take super-liners and an expected expansion of South Bank Parklands and surrounds. The business case will be prepared by Building Queensland and the Cross River Rail Delivery Authority which is developing the masterplan for the Roma St precinct. It is due to take six months and consider construction costs, economic benefits, delivery and procurement options. Brisbane Live! is the brainchild of AEG Ogden, which is partnering with the Government in an early operator engagement agreement. Chairman Harvey Lister said the $450 million arena was designed to host world-class acts and sports up to Olympic level as well as booming esports video gaming events. “We are delighted to see the enormous amount of determination and commitment by the Premier and Deputy Premier to make something happen that the city really needs,” he said. The inclusion of Brisbane Live! is expected to boost the business case for the CRR, delivering the economic benefits Infrastructure Australia has demanded to see before restoring its high priority project status. Ms Trad called on the Turnbull Government to support Cross River Rail in Tuesday’s Federal Budget. A proposal to build a new 17,000-seat entertainment precinct over Brisbane's Roma Street train station will be evaluated over six months. The project has not been approved, but the Queensland Government has agreed on Sunday to contribute $5 million to develop the business case. The proposal – first released in May 2016 - comes from the operator of the Brisbane Entertainment Centre at Boondall, Harvey Lister from AEG Ogden. This entertainment precinct project is backed by both major parties in Queensland. The project proposal over Roma Street station will now be linked to the development of Brisbane’s $5.4 billion underground rail project, Cross River Rail. The Cross River Rail will build a new underground rail station at Roma Street Parklands as part of an underground link from Annerley to the RNA Exhibition Grounds at Bowen Hills. The Queensland Government has now agreed to link the two projects in the planning phase. Deputy Premier and Treasurer Jackie Trad said the entertainment precinct project – called Brisbane Live – demonstrated the underground Cross River Rail project could transform Brisbane. “Brisbane Live is a proposal for a 17,000 seat world class entertainment arena, similar to the LA Live complex, which would become Queensland’s premier entertainment venue hosting international live entertainment and world-class events,” Ms Trad said. AEG Ogden’s Harvey Lister welcomed the decision by the Queensland Government to begin a business case. “Having a centrepiece world-class arena means we are better placed to attract world-class acts,” Mr Lister said. He said his experience as operator of the Brisbane Entertainment Centre was an advantage in developing the new proposal. The business case will be prepared by the Queensland Government’s infrastructure priority body, Building Queensland with the Cross River Rail Delivery Authority. The Cross River Rail Delivery Authority was established by state cabinet to develop the plan for the Cross River Rail Authority. It is easy to see the politics creeping back into this, or is it the case that it never really went away. Labor: Vote for us because a vote for them will kill off the fun place to be, as they don't support CRR to get you to the venue and back home again. LNP are ant-entertainment and anti-fun wowsers. This is even more of a fantastic project for the feds to throw their money at. LNP: We would want to see the Business Case for Brisbane Live before we state whether we support it or not. If it is anything like the CRR business case, the funding won't stack up. CRR won't cost $5.4b, but $15b. Brisbane metro is the proven winner, while CRR is not needed in the immediate future. We call upon Ms Trad to state whether a Labor Government in Queensland will put money into a private sector venture like Brisbane Live. Will they sell out Queenslanders by not charging developers for occupying the space above Roma Street Station? Labor should come clean on what back-door deals it has done with AEG-Ogden. The usual nah nah naar nah-nah base political argument from Queensland pollies, just wait and see. It is all about political differentiation and not much else. Possibly for the same reason, Malcolm Turnbull might eventually fund Trouts Road Corridor through a string of Labor-held seats in Brisbane's North-West. When Jacki stamps her foot again, Malcolm will say Queensland Labor has sold out its voting base in a large part of Brisbane without good public transport. Hasn't Hon Jackie Trad said that because the State Government has already budgeted for Cross River Rail, the $800 million that Bill Shorten promised for Cross River Rail releases those dollars for other infrastructure projects. Now she's asking for more money from the federal Government for Cross River Rail. Either she cannot, as the Treasurer of Queensland add up simple sums - or else there's something very fishy with the figures. The truth is out there somewhere..
BRISBANE’S ageing transit centre in Roma St will be demolished in about 18 months to make way for a new underground Cross River Rail station and the $2 billion Brisbane Live precinct. The Sunday Mail can reveal demolition dates have been set, with both the transit centre and the adjoining Hotel Jen to be knocked down at the end of 2020. Treasurer Jackie Trad said early works would begin at the site next year. “Roma Street Station is a key link between the city centre, Roma Street Parkland, Spring Hill’s schools, Caxton St, the Petrie Barracks, Suncorp Stadium and the cultural precinct at South Bank,” Ms Trad said. “However the Brisbane Transit Centre is well past its prime. Ms Trad said the new station would be used by more than 230,000 commuters each week once complete. The announcement is further proof work is pushing ahead on both the $5.4 billion Cross River Rail and Brisbane Live. The Sunday Mail revealed last week the state had set aside $5 million for the business case for the project, which is being prepared by Building Queensland and the Cross River Rail Delivery Authority. The project is modelled on the LA Live! concept in Los Angeles, and will feature a 17,000-seat arena for entertainment and sports events as well as restaurants, bars, cinemas and other venues. “Without Cross River Rail, this type of urban renewal simply wouldn’t be possible, which is why the Palaszczuk Government has stepped up to fund this transformational piece of infrastructure,” Ms Trad said. Fantastic. The transit centre is a complete embarrassment. The Transit Centre was opened in 1986!